Reduces mental stress, irritability, anxiety, and restlessness that can lead to occasional sleeplessness*. TRANQUIL Nighttime Stress Relief supplement caplets contain two widely recognized, non-habit forming, natural ingredients to help relax and calm your mind before bed so you can fall asleep naturally*. TRANQUIL Nighttime Stress Relief caplets contain no heavily sedating drugs, are easy to swallow, and may be taken as needed for predictable, effective relief from sleeplessness due to stress and anxiety*. Information on this page applies to both TRANQUIL Nighttime Stress Relief and TRANQUIL Stress Relief Formula. What is Tranquil Nighttime Stress Relief used for? Tranquil Nighttime Stress Relief is a dietary supplement that helps relax and reduce occasional simple nervousness, tension, restlessness and related irritability that can cause occasional sleeplessness*. What are the main ingredients in Tranquil Nighttime Stress Relief? 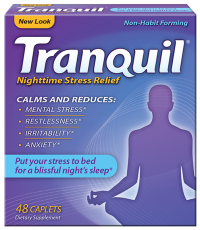 Tranquil Nighttime Stress Relief is a Dietary Supplement. Each two caplet serving contains 240 mg of Hops extract (flower) and 500 mg of Valerian extract (root). Are the main ingredients natural? Yes, Hops extract and Valerian extract are natural ingredients that come from plants.